Scope of work: Creative directing, Interior Design, Curating. This is our first exhibition work. 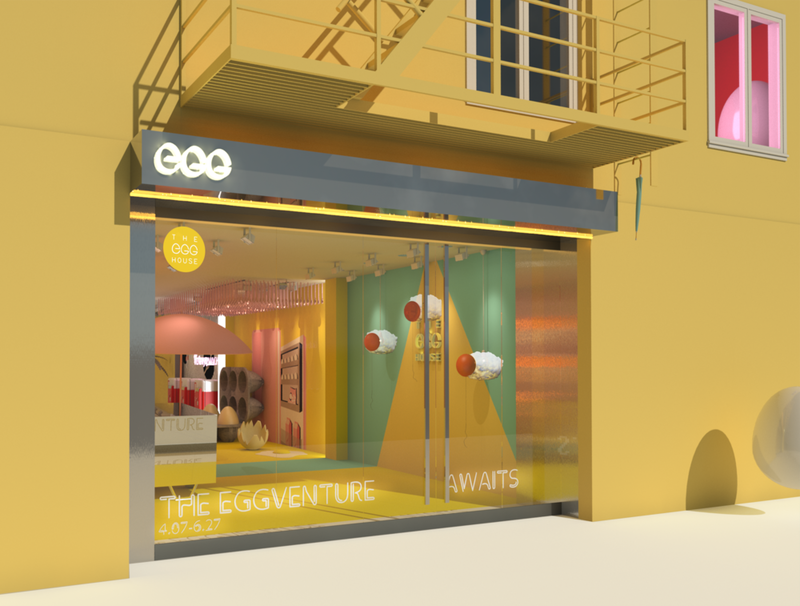 We created and developed the story line of Ellis the Egg’s dream adventure. Exterior look of the venue. Exclusively rendered for “The New York Times”. 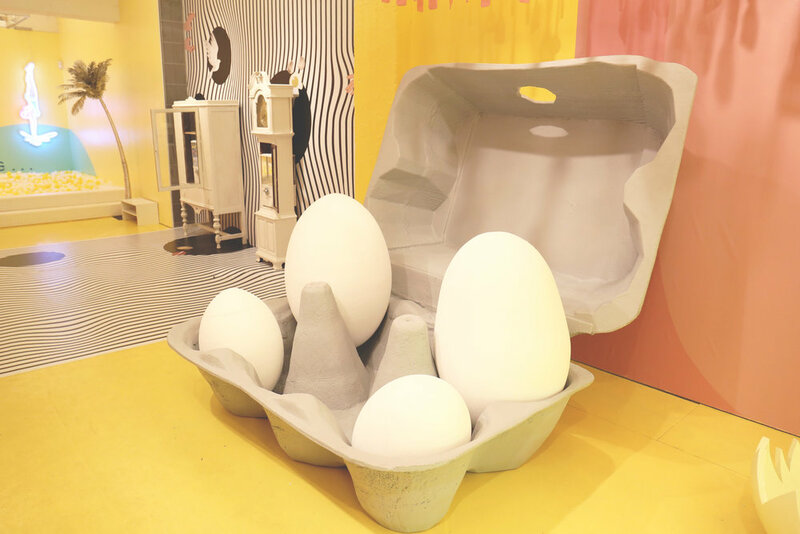 The exhibit implores visitors to imagine the home of a fictional personified egg character named Ellis, who just so happens to have built his nest in New York City. Each of the exhibit’s rooms in the house—including The Foyer, The Kitchen, The Hallway, The Pool, and The Garden—is meant to be a different part of this egghead’s home. The very first scene of Ellis’s dream is a kitchen. We want people to explore these scenes using a first person angle, as people imagining themselves to be Ellis, seeing all his friends, either be in the egg carton, or on the door of a refrigerator. One of them being half-broke, spatula all over the place. As we all know, dream are consisted with elements that we see on a daily basis. And these, are what Ellis is dealing with everyday. This is where things getting adventurous. It is like a rabbit hole. 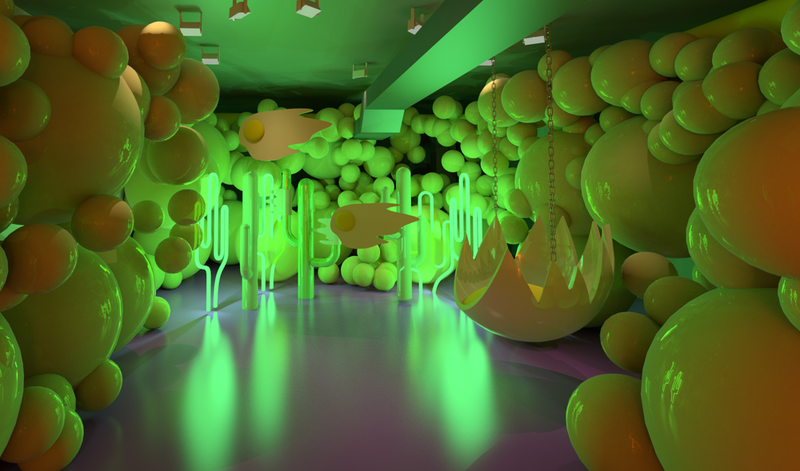 Things pop up in between the wiggly lines, the twisted dream space. All the things that Ellis has engaged with, or things he has dreamed about. While you going through this rabbit hole, don’t forget to open one of these fridges, and get some souvenirs, it’s like your dream too, you never know what you are gonna get from it. “The Last One In Is A Rotten Egg!” Yes, Ellis dreamed about having a pool of his own. Full of his friends, different eggs and salmon eggs. When we getting to the lower level of the house, things is getting a little spooky now.